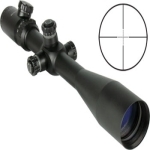 Finding the correct riflescope for your situation can take in many different variables. I recall that years ago, my brother-in-law, who is one of my favorite hunting companions, was talking with my mother-in-law regarding Christmas gifts that were hunting oriented. He was telling her that quality was important in equipment that you depend on outdoors like riflescopes. So, she then buys him the best binoculars she could find for him to use in hunting. They were HUGE and problematic to carry in the field. However, they were good quality. What my brother-in-law didn’t address with her, an outdoors novice, was that there are many different variables to consider with hunting equipment. This is certainly true in regards to telescopic sights for rifles. When I considered purchasing my recent tactical riflescope, my means and needs were much different than when I purchased my first one about 30 years ago. Of course, paramount was the desire to find a quality riflescope for the value. Another item to consider is which brand to purchase. There are over a dozen different companies. Pentax, Nikon, Leupold, and Burris are popular brands. These companies combine high quality with a reasonable price. I found that three items are important for this selection. These include: The type of firearm used, the type of shooting, and personal preferences for features like color and reticle type. The first task for the novice riflescope purchaser is to learn how a rifle scope functions and it’s parts. This knowledge will help one make a more informed choice of what scope to buy.